Maria (Preston) Einolf, age 96, of Laurel, Maryland passed away on March 25, 2019 at her residence. Born October 30, 1922 in Baltimore, Maryland to Marie (Grunder) Preston and John J. Preston, she attended St. Bernard’s School and the Institute of Notre Dame where she played basketball and edited the school yearbook. She married Henry C. Einolf (Petie), who she met at the age of 8, on September 28, 1946 at St. Bernard’s Catholic Church. After working at the C & P Telephone Company, she was a homemaker. Later in life, she took creative writing classes at Notre Dame University and worked briefly at Peck Real Estate Group. 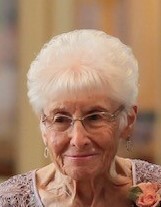 Maria had been a member of St. Nicholas Catholic Church since 1968. She co-chaired the Bereavement Committee for over 30 years, was a member of the Altar Society, and volunteered in the church office before Saturday Masses. She enjoyed writing letters, reading mysteries, watching crime-dramas, traveling, and being with her family. She is survived by her daughter, Michele M. Einolf and husband, Kenneth W. Grice and daughter-in-law, Sam Toffy-Einolf, grandchildren, Shaun M. Einolf and wife, Janet, Noelle E. Vilardo and husband, Daniel, Aaron M. Grice and wife, Lisa, and Jared M. Grice. She is also survived by her great-grandchildren, Connor and Charlotte Einolf, Ella Vilardo, and “baby” Grice, due in June. She was preceded in death by her husband (2010), and sons, Dennis N. (2017) and Michael H. Einolf (1977). Visitation will be on Monday, April 1 from 5 - 7, and Tuesday, April 2 from 1 - 3 and 5 - 7 at the Donaldson Funeral Home, 313 Talbott Ave, Laurel, MD 20707. Mass of Christian Burial will be held at St. Nicholas Catholic Church, 8603 Contee Rd., Laurel, MD. on Wednesday, April 3 at 11 a.m. Interment Meadowridge Memorial Park, Dorsey, MD. In lieu of flowers, contributions can be made to the St. Nicholas Capital Campaign.